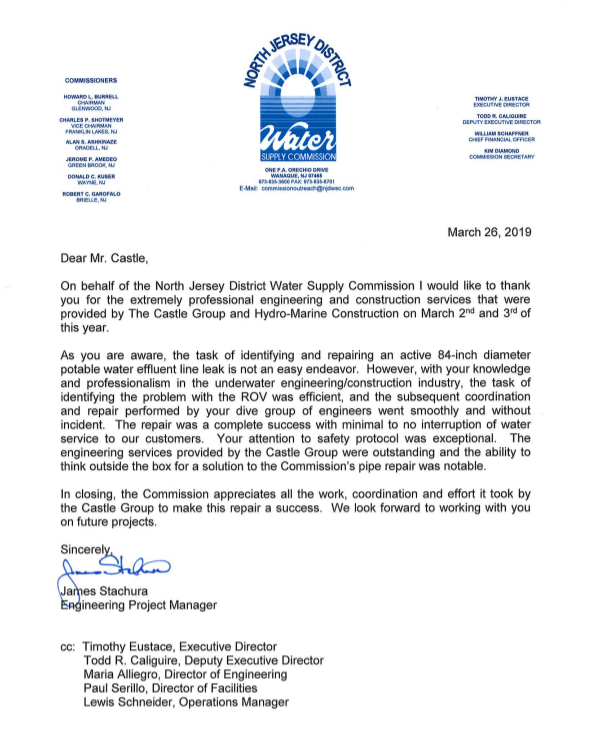 On behalf of the North Jersey District Water Supply Commission, I would like to thank you for the extremely professional engineering and construction services that were provided by The Castle Group and Hydro-Marine Construction on March 2nd and 3rd of this year. As you are aware, the task of identifying and repairing an active 84-inch diameter potable water effluent line leak is not an easy endeavor. However, with your knowledge and professionalism in the underwater engineering construction industry, the task of identifying the problem with the ROV was efficient, and the subsequent coordination and repair performed by your dive group of engineers went smoothly and without incident. The repair was a complete success with minimal to no interruption of water service to our customers. Your attention to safety protocol was exceptional. 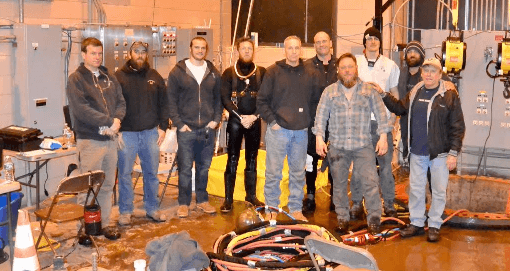 The engineering services provided by the Castle Group were outstanding and the ability to think outside the box for a solution to the Commission’s pipe repair was notable. Commission appreciates all the work, coordination and effort it took by the Castle Group to make this repair a success. We look forward to working with you on future projects. I want to thank you for doing an excellent job on the underwater pier repairs supporting the former Poughkeepsi-Highland Railroad Bridge, now the Walkway Over the Hudson State Park. From our earliest interactions on the scope of the work through completion of the as built drawings you and your team were very professional and most responsive. The work was completed on schedule at the contracted cost with virtually no issues. This is a sign of excellent planning and execution. Congratulations and thanks to you and all of your team members. It was a pleasure to work with you. Sr. Project Engineer / V.P. In 2005, W.J. Castle, P.E. & Associates, P.C. was retained by our Chester, PA facility to perform underwater inspection, analysis and design repairs for all of our marine structures. These structures included high and low deck piers, concrete, wood and steel bulkheads, steel and timber pilings, outfall structures, etc. Rehabilitative designs were also required which included plans and specifications for bidding.